Smobriety would be miserable and that I would never have fun again! What is night with my buddies when the room isn't full of smoke? 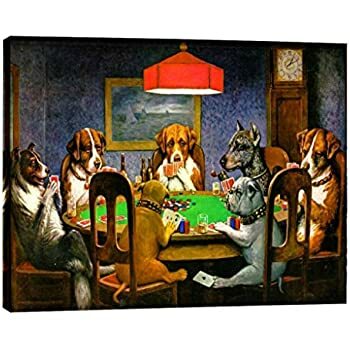 I grew up with this painting in our den. Liking dogs I spent hours watching it and defining the word fun with this picture! 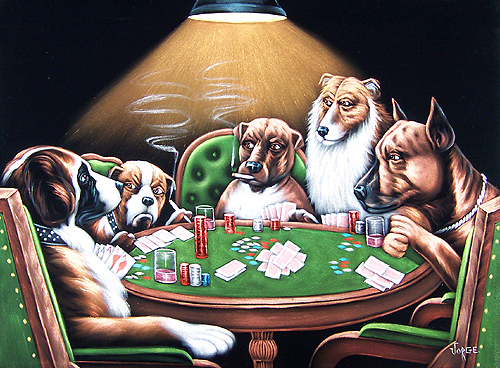 I watched our family gatherings of getting a foursome and playing bridge all night while the ashtrays filled up. Every home I visited the hostess would invite folks for a cigarette from her fancy cigarette box and her adorned drawing room lighter. All the gentlemen carried a silver or leather portable cigarette box in their jacket pocket with matching lighters and the ladies had little crocheted purse with pearls sewn into them - again with matching pearl and crystalline design on the lighters. Beautiful crystal ashtrays set on every living room coffee table and bedroom bureau. Then the laughing and joking and relaxing (adult) fun began! So friends, family, fun and happiness were all tainted with nicotine pollution before they even formed into beliefs. Beliefs are very challenging to change. But I have radically changed my core beliefs about smoking. All of these memories along with my own happy memories linked to Sickerettes! When these same folks passed one by one in their 60s from one cancer or another nobody made the connection - this aunt from breast cancer, that one from leukemia, this grandfather from pancreatic cancer, that grandmother from bone cancer. 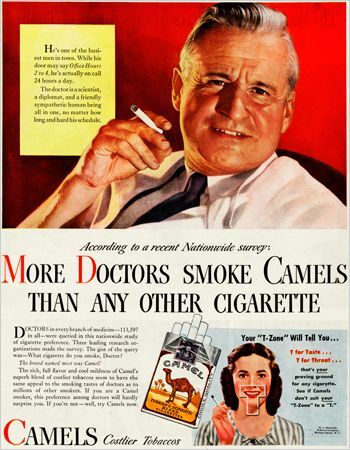 - had nothing to do with tobacco - it must be those newfangled radios, tvs, telephones and other gadgets - not cigarettes. Doctor after doctor told us how great they were for one's health! I felt so responsible when my Mother sent me to Safeway to purchase her Cigarettes and came back with the right change! I stood a little taller when I was allowed to hang out with the smoking adults and vicariously enjoy the fun! Changing such core beliefs is a huge challenge. It took Years and Years of retraining in school, on the news, through observation but it never really sunk in until I was diagnosed with Emphysema and therefore, COPD at age 52. And then serendipitously I was laid off and found my new job in Assisted Living where I daily eye witnessed the long term consequences of COPD. At Eight Years of FREEDOM from Addiction I have learned how to filter those beaustiful, fun, happy days, from the ever present Sickerette. Much of the fun had to do with gathering, playing, sharing, yes - showing off a little, but it wasn't really that box full of dead leaves wrapping in paper and dipped into thousands of poisons! So I don't throw the baby out with the bathwater. We really did have Fun. We really were Happy.It really was relaxing but Sickerettes are not required to make that happen. I kept the good and rejected the bad elements of those memories and they're still precious memories of my youth! Boy, your blog really got me thinking. I never really thought to much about how much cigarettes are associated with fun! It's crazy! But I grew up watching basically the same thing. Everyone sitting around drinking and smoking endlessly. The only difference is my mom quit smoking while my father didn't. I went through the surgeries and hospice with my father who died of throat and liver cancer at 65 due to smoking. My mother is still alive and in her eighties. That would explain the strong trigger that drinking causes I think. Thank you for sharing this thought provoking blog and good to see you! What incredible descriptions! I so clearly remember my grandparents having an ornate table lighter and a "silent butler" for emptying ashtrays. Somehow in those days the smell of cigarette smoke and full ashtrays were the same to me as her Evening in Paris and his Old Spice. Just the ordinary smells of grownups. My very first cigarettes were stolen from the bureau drawer in the dining room in their house, in fact. Memories. Whenever I think of my dad it's always with a faint whiff of Old Spice & cigarettes. Congratulations on a great quit. Oh yes, the memories. Smoking and drinking and laughter and peanuts and card playing. And they all looked so cool when they were doing it. 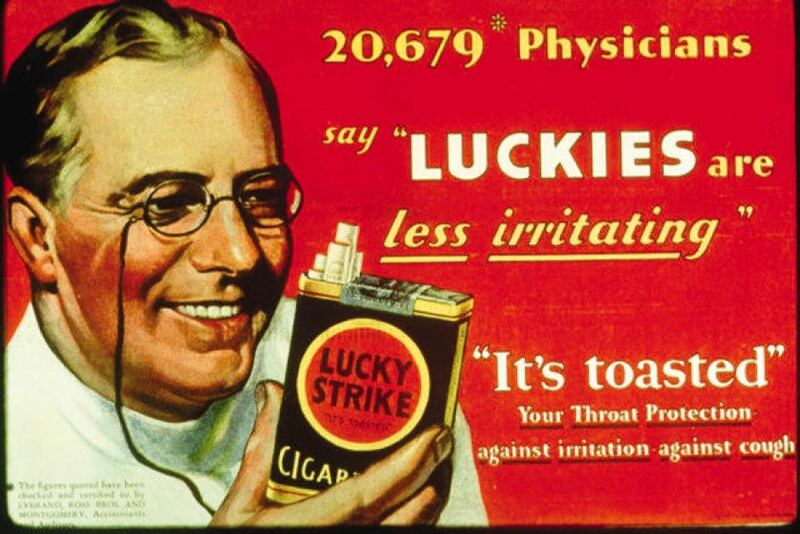 No wonder we wondered how we could enjoy life without a cigarette in hand. We have to wash out and wash in the new thinking. Great blog. Congratulations on your 8 years of freedom Thomas! That's awesome. I grew up in the same atmosphere. And you're right...rewiring ones self take quite a while. But we're doing it! Mark Glad it was posted missed part I thanks. Sure thing. Sometimes if you can't find it on your own you can look at the Recommended/related links at the bottom. OR in this case there is also an "incoming link" since I put a link in that post back to this one to cross-link them. Great blog Thomas. A great one to read on day one of my quit. And I'm shooting for 8 years + like you. Way to go!!! I am on day 9 and needed a pick me up. Thanks for the blog it shows that I can stay strong. tporter51 Congrats on Day 9! And they smell a LOT better! My husband has had prints of this in his antique business...I think it's hilarious. We DO have more fun as EX smokers! Congratulations on 8 years Thomas! In HIS love and service I LOVE you MY beloved Thomas and what a WOW - EYE opener to a good TRUTH filled BLOG- about NICOTINE generational addictions - DOESNT MEAN WE have to CHOOSE generational SAME ways as theirs- WE get to CHOOSE our own way - NEW mindset - gentle hug.